Ecola State Park over looks Cannon Beach Oregon, here the fog is coming in and blanketing the mountains in the distance. 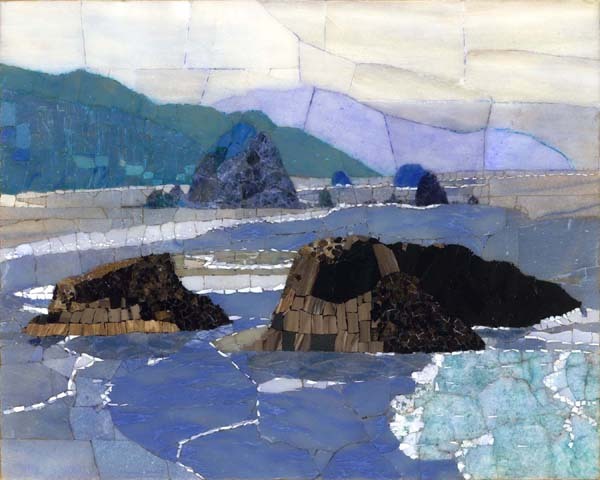 It is through the pattern and color in the rocks that the scene is created. The ocean water is sliced blue quartz; the rocks in the foreground are brown petrified wood and dark sea shells. The dark blue rock in the background is sodalite and the sky in the background is alabaster.